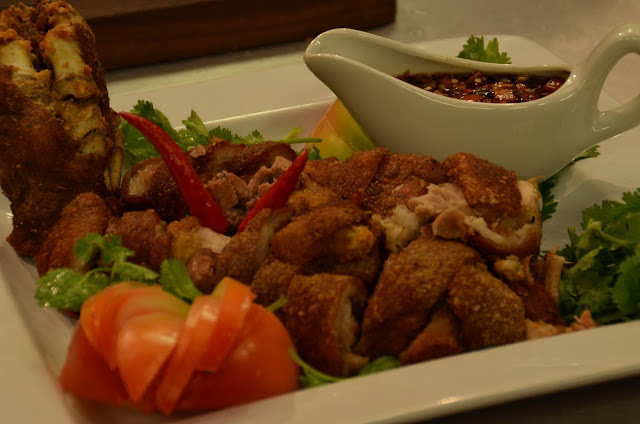 First, the internationally acclaimed chef whips up Boneless Crispy Pata, guaranteed to whet dad's appetite for porky delights. "The Good Daughter" actor Rocco Nacino sinks his teeth into the crispy-outside-but-juicy-inside chunks of this festive fare and pronounces it a winner. 1. Debone and remove the meat inside then season with salt and chopped garlic, black pepper and a little bit of paprika. Wrapped in cheese cloth and tightened with butcher's string. And cook the pork leg or pata in boiling water with salt and whole black peppercorn for 1 1/2 hours or until tender. 3. Place pata in a deep pan filled with cooking oil; simmer for 20 minutes on very low heat. Set aside to cool. 4. Place again in cooking oil and simmer for another 10 minutes on very low heat. Then deep-fry for 5 minutes on high heat, or until golden brown and crispy. 5 Slice into thin rounds and serve with soy vinaigrette on the side.